Ministry of National Treasury will from 11th Monday 2019 start Pensioners and Dependents headcount for beneficiaries of Public Pension Scheme. The mission is supported by the retirement’s benefits authority (RBA). 1 Who is supposed to go for Pension Headcount? 2 Why pensioners Head Count? Who is supposed to go for Pension Headcount? The reason why the pensioners head count is being conducted is to ascertain the exact number of Kenyans who are under the public pension scheme for budgetary allocation purposes. I would like to know what will happen to pensioners who are currently out of tbe country for various reasons: health, business, visiting or missionary assignments. Can they go individually to the Embassies of Kenya and present those docs.? Please reply. Hi my dad is on medication here in mombasa we discovered late for him to go for the head count of penson.How can l be assisted.Can you add more days for those that didnt make it.I visisted huduma centre mombasa this morning they told me the last day was on friday 22nd februaryThanks looking forward for ur response will appreciate. Please advise on people outside the country. Can they complete the exercise at Embasies? 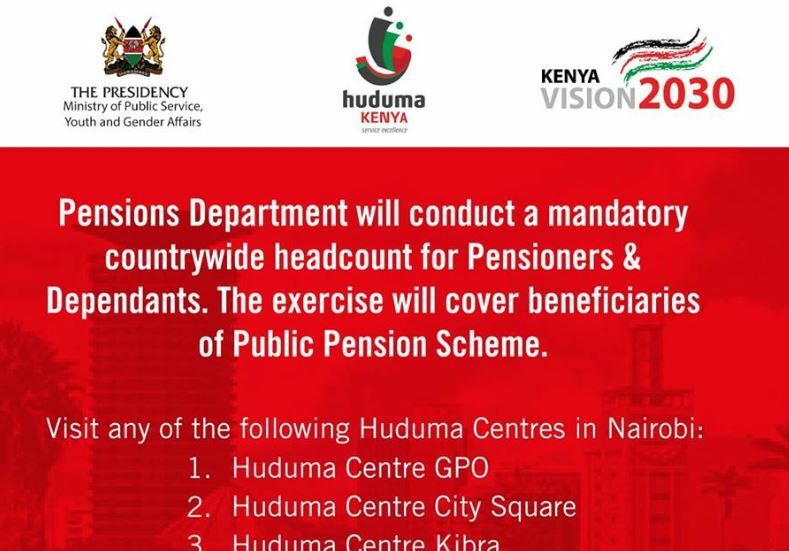 Please, i would like to know for those pensioners who are currently out of the country for various reasons and will not be able to present themselves in person at the Huduma centers within the stimulated period of time, is there a way for doing it online or will there be a grazing period after May 3rd 2019. What happens for Parents who have travelled outside Kenya and the count is on going? Kindly let me know what happens to people who are out the country and would not be able to make it on time at huduma centre. To The Director of Pension. I am a pensioner and currently out of the country. unable to present myself in person at Huduma Centres within the stipulated time scales. Is there a way of doing it on line or will there be a grazing period after May 3rd 2019 ? I missed the exercise in my region can I do in Nairobi? My mother is a pensioner and she is currently out of the country. Is there another way for her to present the documents that you require? She might not be able to make it to the head count by May 3rd. How can people who are outside the country participate? Currently there is no available information or arrangement to register people out of Kenya…. To the director of pensioners, let’s say you are from another region of Kenya for example Kisumu county and you want to register your pension in Nairobi is it possible to do so please respond back.thank you. My Mother is a pensioner what i know is that most of her children don’t have birth certificates. in this scenario what will happen?